The life of the Slovakian Alexander Moyzes bestrode the 20th century and is deserving of as much attention as his compatriots Suchoň and Cikker. He was writing music from just after the Great War until five years before the fall of Communism. It comes as no shock that he was also steeped in Bratislava's teaching life and radio administration. From a musical family, his teachers included Vítĕzslav Novák and Otakar Ostrčil. His purely orchestral symphonies run to twelve, all recorded in Bratislava in the 1990s. As Mike Herman reminds us, we need to factor in two unrecorded Symphonies: Sinfonia-Cantata, Op. 12 for Tenor, Mixed Chorus and Orchestra ‘Demontage’ (1930-1932) and Sinfonia da Chiesa, Op. 36 for Soprano, Tenor, Baritone, organ, Mixed Chorus and Orchestra (1941-2). Other works include Dances from Gemer, Op. 51, and Down the River Vád, Op. 26, a concerto apiece for violin and for flute, two string quartets, a wind quintet and the opera Udatný král (‘The Deposed King’), as well as various songs and incidental music for cinema, radio and theatre. The Moyzes First Symphony betrays various allegiances: Mahler, Strauss, Schmidt and early Szymanowski. Density and richness of texture are not one and the same and in the first movement Moyzes cannot escape a degree of coagulation. His thematic invention at these moments does not compensate sufficiently although he comes close at 11:28 where he launches a romantic melody ranking with Prokofiev's Romeo and Juliet. The music at 12:22 is indeed something of a luxury item. The deeply felt Adagio is good - seeming to take life from Suk's Wenceslas Meditation and Debussy's La Mer. The wind-dominated scherzo skips sturdily along and leads into a finale which is successful when it is light and blissfully wraith-like but which becomes ponderous and congested whenever Moyzes reaches for heroism and the drums. The work was premiered by its dedicatee, Oskar Nedbal in Bratislava in 1929. 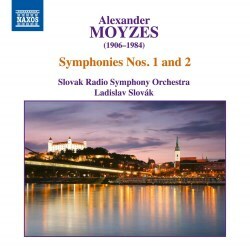 Moyzes’ Symphony No. 2 is, unusually enough, in two movements. It dates from a couple of years after its predecessor and was first performed in this version by the Bratislava Symphony Orchestra on 14 March 1942 under Josef Vincourek. Here the writing is more jagged and rugged (Prokofiev's 'parade-ground' style as in Symphony No. 4 and Love of Three Oranges). It is as much touched with cataclysm as the Kurt Weill symphonies. That said, it finds time for a lengthy dream-like interlude reminiscent of the nostalgic homecoming theme from Hugo Friedhofer's music for The Best Years of Our Lives. Moyzes also draws on some Straussian solo violin passages. Here is a composer at his best in delicacy and at his most prone to self-indulgence in the extremes of emotion. A ruminative meandering overhangs the proceedings although these plays out hypnotically. 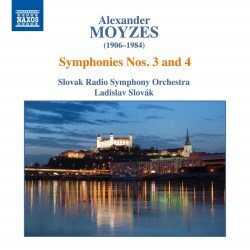 Moyzes launches his Third Symphony with a Beethovenian crunch. As its five trim little movements unfold it comes as no surprise to read that it is derived from his 1933 Wind Quintet. Eminent moments for the wind survive the translation to full orchestra. The music exudes a wan charm with hints of Parisian impressionism. The Fourth Symphony has a grim jaw-set and is generally a much more effective work than its sallow derivative predecessor. This is a big work with, as the notes suggest, a Sibelian caste to the melodies. Smetana's historic symphonic poems are also a dim and distant forebear. There is a long and quite magical oboe-floated elegy in the second movement. The inspiration in the finale strikes me as being at a lower level, lacking symphonic inevitability. Moyzes is another character worth exploring and pioneers should start with the first disc. Both are respectably recorded. The liner-notes, in English only, are by Keith Anderson and Ivan Marton. Conductor Ladislav Slovák took in both the popular (Tchaikovsky piano concerto no. 1) and the obscure but deserving (Kalabis). This steadily unfolding symphonic series echoes the work Marco Polo and Naxos did for the Hungarian symphonies of Laszlo Lajtha in Pecs. As with the Lajtha series, these were released by Marco Polo in the 1990s and are now being reissued by Naxos.